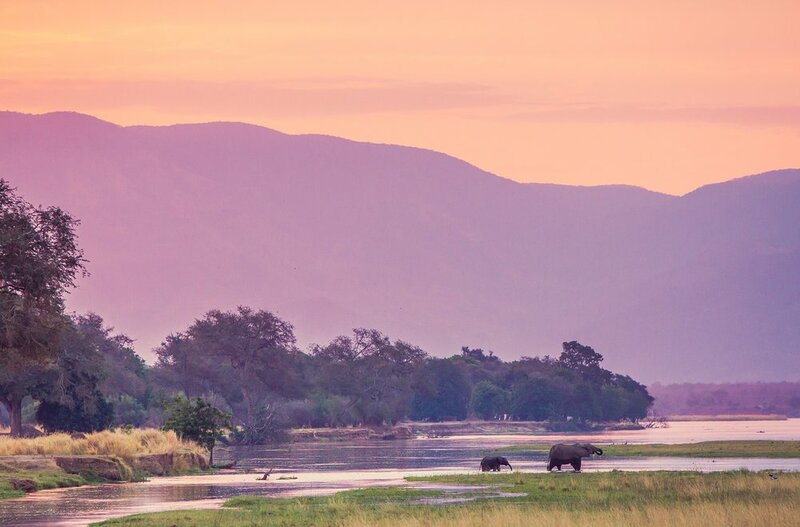 This is where you’ll find one of the most pristine, untouched and wildest landscapes in Africa – the continent’s fourth-largest river, the Zambezi, is a spectacular feature, of course, with characterful old ox-bow lakes, sandbanks and channels along its length. Featuring dramatic riverine flood plains that stretch for miles, deciduous miombo woodlands, (tall leadwoods, winterthorns, ebonies, acacias and fig trees) and mineral-rich grasslands, the Zambezi Valley attracts a prolific and diverse wildlife population. Those who have visited the valley know its incredible beauty. They also know that part of the magic of the place, especially in areas such as Mana Pools National Park, a UNESCO World Heritage-listed site on the valley floor, is down to the magnificent elephant populations found here. In the Middle Zambezi alone, there are many complex landscapes, facing a variety of different challenges, poaching being one of them. The decline in the elephant population due to poaching and other factors is alarming. In the last few years, the numbers have dropped to 3,500 from 14,000 in 2001, while in the Lower Zambezi elephants have declined from a healthy population of 19,000 in 2001 to approximately 11,500 today. From its source in northern Zambia, until it empties its life-giving waters into the Indian Ocean in Mozambique, the Zambezi River travels over 2,700km. The legendary river enters Zimbabwe at the Zambezi-Chobe confluence close to Kazungula, where the boundaries of Namibia, Botswana, Zambia and Zimbabwe merge. The river is broad and shallow and scattered with outcrops of basalt rock. There are numerous islands, which abound in rich vegetation, wild animals and birds. The waters harbour many species of fish, as well as numerous hippos and crocodiles. The variety of tress is extensive, including fascinating baobabs and ilala palms. The Victoria Falls' high and thundering smoke-like spray can be seen from miles away and beyond them, the river travels through a series of basalt gorges with numerous rapids, offering the famous whitewater rafting activity. The white water ends near the Deka Gorge where the river widens into the upper reaches of Lake Kariba. 220km downstream and below Kariba wall, the Zambezi flows for some 20km through a sheer gorge before expanding over a flat alluvial plain. The 220km stretch from Kariba Dam to Dande is the longest contiguous wildlife/wilderness (protected area) along the rivers entire length from source to mouth. The banks of the Zambezi River in Zimbabwe are state-owned and reserved for wildlife safaris and game management and include the extensive and idyllic Mana Pools National Park, which is a walking safari area, rich in bird and animal life. Beyond Mana Pools, the river flows to Kanyemba where it leaves Zimbabwe to travel through Mozambique on its journey to the sea.